Nest Protect Smoke Carbon Monoxide | Global Warming & Cooling, Inc. 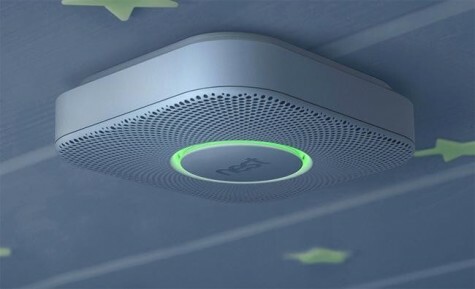 The Nest Protect smoke and carbon monoxide (CO) alarm quiets down when you wave – no more swinging towels or brooms and trying to shut down a loud alarm in your home. It sends a notfication to your smart device when the alarm goes off and when the batteries run low. Instead of just chirping and howling at you, the Nest Protect speaks and thinks using a human voice. It gives you a friendly ‘Heads-Up’ before burning toast turns into an emergency, and tells you which room the smoke or CO is coming from. Do ‘Low-battery chirps’ ever rattle your dreams? The Nightly Promise feature shows you its sensors and batteries are working before you doze off. Nest wave – no more swinging brooms or towels, silence alarm with the wave of your hand. Heads-up – get a friendly alert so you can handle burning toast before a piercing alarm goes off. Be Alerted from anywhere – Send a message to your phone if the alarm goes off and if batteries run low. Nightly promise – A quick green glow at night lets you know it is on and working. Silence the chirp – Low-battery chirps can interrupt your sleep. The Nest Protect will help you sleep better at night. Safe for kids – Children can often sleep through alarms and loud noises, so in addition, the Nest Protect uses voice alarms to help alert them.